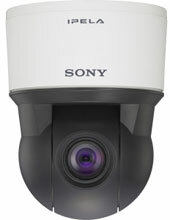 The Sony-Electronics SNC-ER520 is an endless 360 degree, Network HD Rapid Dome Indoor Camera with 36x optical zoom. The SNC-ER520 camera supports three compression formats: JPEG is the best choice for high-quality still images, MPEG-4 provides clear video images over limited-bandwidth networks, and H.264 is the alternative for severely limited-bandwidth networks, with twice the efficiency of MPEG-4. Sony"s DEPA (Distributed Enhanced Processing Architecture) technology allows the SNC-ER520 to send not only images but also related metadata, including object size and position, to the DEPA-enabled recorder. Unlike conventional analytic systems, where all of the image processing is performed by the recorder, DEPA thereby avoids CPU overload. The Sony Electronics SNCER520 is also known as Sony	SNY-SNCER520	.